Last September, I went with some friends to a show at the M Bar called Get Mortified. 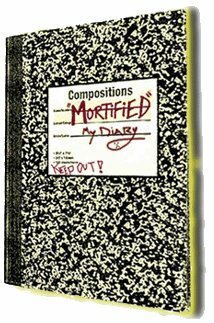 In Get Mortified, a lineup of adults read you their embarressing teenage journal entries, poems, love letters, etc. These adults had to try out to be in the show, so they typically end up being stand-up comics or actors, although technically, anyone can audition. The show started in Los Angeles about 4 years ago, but has spread to cities like New York City, San Francisco, and Boston. I thought the show was entertaining, but it didn't knock me out. It made a much more powerful impression, however, on two of my friends. They loved it so much, that they decided to throw a party where everyone was to bring Get Mortified material to share. This happened last night at one of their houses in Pasadena. Raisin in the Sun wouldn't be considered one of my favorite books. I probably wouldn't have read the whole thing if it wasn't manditory. I'm not putting down the author or anything. It's just not my type of book. Even though I didn't care for the book, there were still some things that I learned about life. I learned not to judge people by their skin color. Also, I learned the typical family day in a black family. Another thing is that everybody has some sort of dream that they'd like to fulfill and pursue. The one thing that stuck out most to me was not to trust everyone such as Walter trusted Willie Harris. I could go on and on about lessons I've learned, but that would make my assignment too long. 1. My teacher wrote "good example"
2. My teacher circled the whole last paragraph and wrote "this isn't needed". Who was the teacher? The teacher was right, the last paragraph probably wasn't needed. I do appreciate your frankness on the matter of not liking the book. I remember in 2nd grade when Kuang did about 1 million book reports so he could go to the Dodger game, but later admitted that he copied them from the backs of the books. I still have a story I wrote in 7th grade for Mrs. Pollack called SAHCA. It is an acronym that means "Self Automated Home Cleaning Appliance". It's about a robotic line of vacuums that run amok and do bad things. I guess my love of cleaning appliances started early! Actually is the last paragraph really a paragraph? It's only one sentence. How many sentences do you need to make it a paragraph? According to the Paragraph Structure section of Wikipedia, a paragraph can indeed be as short as one sentence. I have no idea who the teacher was. I was probably in 8th grade if that helps you remember who the teachers were back then. Yes, I remember Kuang and his sketchy methods of "getting to the Dodger game". Funny memories.